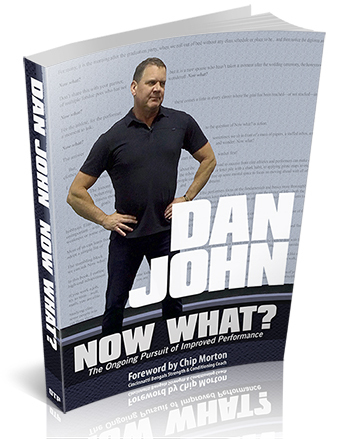 This is an excerpt from Dan John’s Now What? Video. Click here for more excerpts and video clips. I base all of my coaching on this great quote from one of my heroes in this field, Percy Cerutty. I spend my time constantly trying to become more intelligent as a coach. Intelligent work, more efficient technique. All the “er” words—faster, longer, stronger, fitter—that’s what intelligent coaching will bring you. With athletes we have what we call the A to B assessment. If you’re a 60-foot shot putter, where you are today is A. Your goal is your B. If you want to get to 70, we’re going to walk you there. 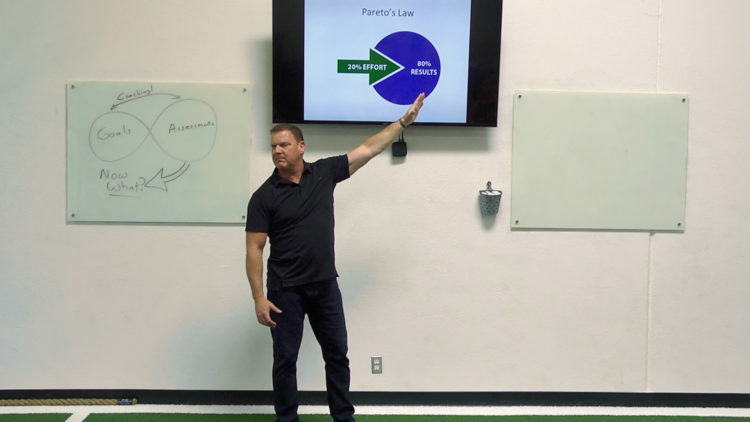 When you’re training athletes, you should spend 80% of your time on the goal—80% of your time on the sport. Give me 20% of the time in the weight room. The program I give them is called Easy Strength. We pick a couple of exercises, maybe the ones they’re gapping—missing—we spend time doing it, and we try to make them stronger. That is so boring, but it’s the truth. We’re going to give them what they need to do, but how do we get the clutter out of their heads? How do we clean up their brains and their lives, so they can actually do what they need to do? Here’s we’re going to head into shark habits, pirate maps, and then talk about the performance side of things, too. 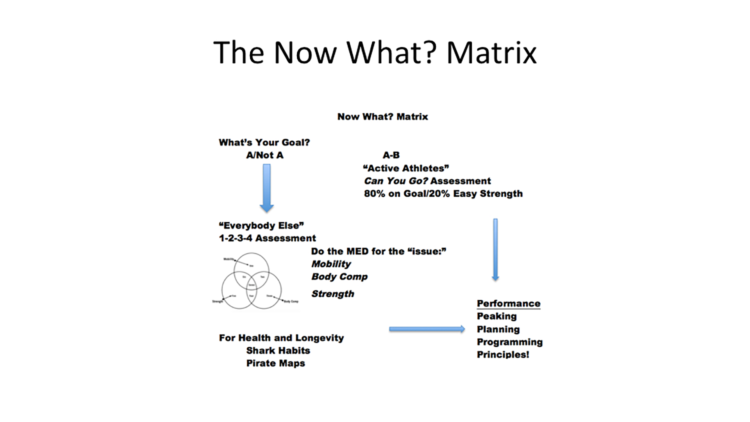 This is called the “Now What” matrix. This is where my brain is heading right now. This is the grid, and there are four charts you really need to understand. These four are a problem in our industry. I use Maffetone’s definition of health: Health is the optimal interplay of the human organs. You find out how healthy you are by going to a doctor, getting a blood test, and then look at numbers. If you have a 700-pound bench press, but have pancreatic cancer, you’ve got a big bench, but you’re not healthy. That’s the mistake we make sometimes. That’s the mistake our clients make all the time. Longevity is to live as long and as well as you can and then, like our Paleo friends tell us, drop dead. Live long, drop dead. It’s a quality of life measurement. 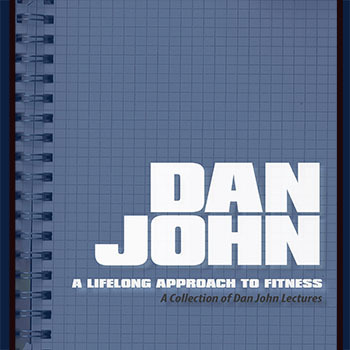 Fitness simply is the ability to do a task. That’s it. Don’t add anything more to it. Fit: the ability to do a task. The last word is the important one in the athletic equation: performance. This is where people are getting stuck. Performance is when it’s 9:00 in the morning, the spotlight’s on you, it’s time to step up and do this thing. The problem we’re having in the fitness field is people think performance is something you do every single day of the week. You cannot be great if you leave it all in the gym. You can do stuff. You can do 10,000 burpees better than I can, but until burpees become an Olympic event, no one cares. What we’re going to be doing in Now What? is looking at this matrix and trying to come up with how you can take a typical client deal with certain things appropriately, right now, right here. 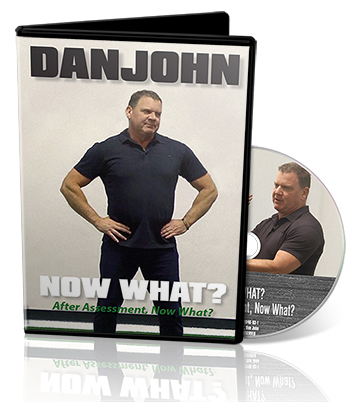 This was an excerpt from Dan John’s Now What? video. Click here to view the preview clips or read more excerpts from Now What?